Anne and Roy delicately recover the decorated pot. We’re working in sunshine . . .
Today is beautifully sunny with balmy breezes and everyone is in a good mood. There is not the slightest hint of precipitation (that word again) and none suggested for tomorrow. Indeed, the site is now so dry that Sarah, from Structure Ten, was spotted damping down some of her surfaces with a water spray. Sarah damps down the floors of Structure Ten. This is to allow the different colours in the ground — signifying, perhaps, different formation episodes — to be seen more clearly. Long may it continue. A lengthy meeting of supervisors was held this morning to work out a sampling strategy for the floors in Structure Twelve. Hugo, who has much experience in this subject through his work in Structure Fourteen, joined in. The floor deposits in Structure Twelve are, however, much bigger and a good deal more complex, but decisions were reached and work began. 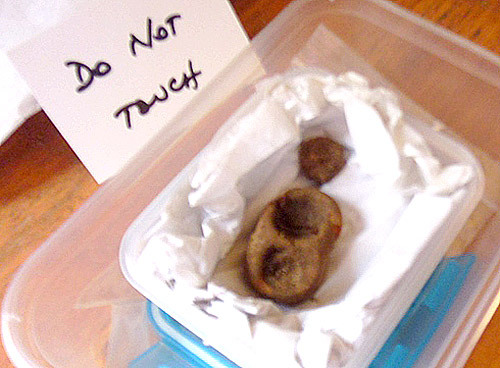 Jo, the micromorphologist, has dug her hamster holes across the floor and taken many samples. By the time she has finished areas of the site will look like a piece of Belgian lace, with more holes than substance. Elsewhere in Structure Twelve, Colin continues to work his work through the robber cut in the eastern entrance to the structure. A slightly clearer image of the decorated pot found yesterday. The magnificent piece of decorated pottery, mentioned in yesterday’s diary, was eventually lifted by Roy this afternoon, with Anne, from the finds hut, in attendance and an audience of diggers and tourists watching. A large cake knife was used to loosen a pad of midden, on which the pot was resting, and it was taken eventually to be dried, slowly and under some damp acid free paper. It really is a most interesting piece of pottery. The complex impressed decoration stretches right down to the base and, at the moment, we are happy to identify it provisionally as Late Neolithic Impressed Ware. Further examination will be carried out when it has stabilised and we will keep you informed. Keir, from the Archaeology Institute, was on site today, taking some students through the often-baffling subject of filling in context sheets. If you don’t know what these are, take comfort. Full knowledge will only shorten your life. The “Flying Mattress” — Hugo’s contribution to aeronautical history — floated across the site this afternoon, with a camera slung beneath and taking some magnificent aerial photographs. Keir introduces the UHI students to the joys of context reporting. 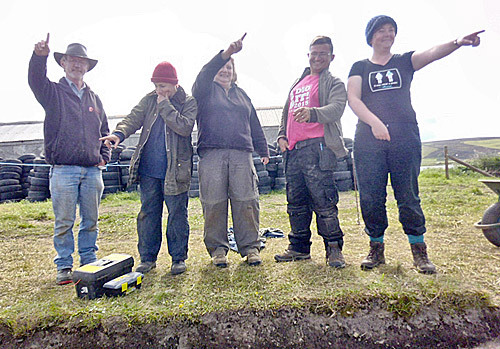 His team in Structure Fourteen have uncovered some small stake holes and a post hole in the structure floor, reinforcing its uncanny similarity to Structure Two in the Barnhouse village, some 300 metres away. Last but not least, another tiny double-pot has turned up, this time in the central midden area. It is really a small pad of fired clay with two finger impressions side by side. It is the second we have found and its predecessor can be seen in the new site guide (available on the internet and good bookshops at a ridiculously cheap price). Frankly, we have no idea what it is. It may have held colour for some purpose or it may just be a potter having fun. Suggestions on a postcard, please. The new double miniature pot. My name is Annabelle and I am finishing my Master’s degree in archaeology in the Netherlands this year. I have done some fieldwork over the past years, but mostly at (early) medieval sites. Which means I am familiar with lots and lots (and lots) of postholes but not so much with stone constructions and prehistory. So, together with two friends, I decided to apply for a dig abroad to see the difference between the methods that are used in several countries and to experience a prehistoric excavation. When I applied for the Ness of Brodgar, honestly, I had no expectations and didn’t even know anything about the site, except that it’s Neolithic. I just set out to dig in Scotland for the summer and learn about the Neolithic. Differences of opinion were evident during this morning’s Structure Twelve strategy discussions. 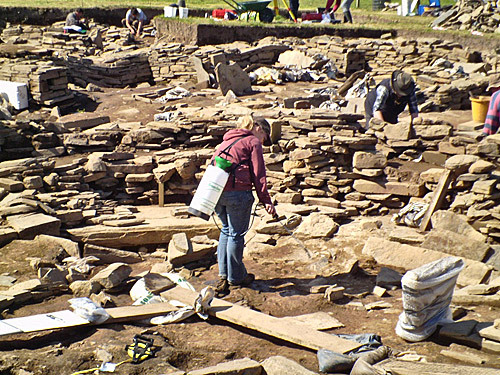 When I arrived in Aberdeen I almost regretted planning a summer dig in Orkney, because I got soaking wet from head to toe as soon as I walked out of the airport. I also realised that packing a bikini was not the best idea and camping was going to be a challenge. Thankfully, I did bring enough warm clothes and waterproofs. I have been on the site for almost two weeks now and it has been amazing. The site is so fascinating and very different from what I am used to excavating and from the first moment on, I knew I wanted to come back next year. Though I didn’t know what to expect when I applied, it has been a great experience so far (even if we are moving those lovely sandbags several times a day). 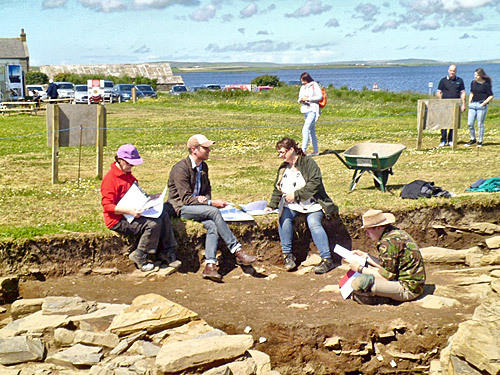 What I also love about the Ness is that there is enough time to learn about the settlement and the methods used in the excavation. In the Netherlands, almost all excavations are rescue excavations and there is limited time to actually learn. Currently, I am working on floor deposits in Structure Ten. I never imagined floor deposits could be so exciting, but they truly are. When I come back next year, I will definitely make sure to pack my skiing clothes instead of a bikini!